When the speaker’s name was announced at the reception following the Miter Society Mass in Indianapolis on Oct. 18, he received a standing ovation. All in the crowd were familiar with him, and many in the crowd had heard him speak previously. But this occasion was unique: It was the first time he’d been introduced to them not as archbishop, but as Cardinal-designate Joseph W. Tobin. 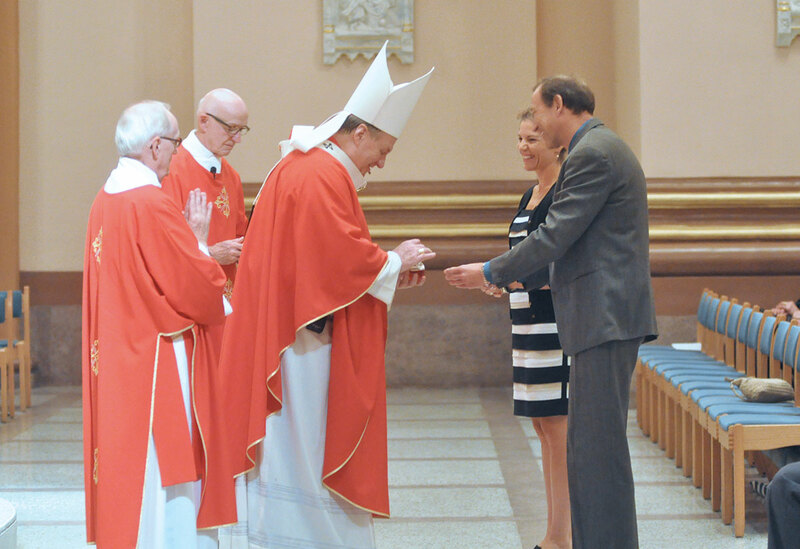 Cardinal-designate Tobin first addressed the members of the Miter Society—those who contribute $1,500 or more to the United Catholic Appeal—during a Mass at SS. Peter and Paul Cathedral. In the first reading from Paul’s Second Letter to Timothy, the cardinal-designate pointed out that Paul’s frustration with his situation—imprisoned, abandoned by his friends, attacked by his enemies—is evident. God’s presence is imperative, he said, in light of the message from the Gospel, that “the harvest is plenty, but the laborers are few” (Lk 10:2). “Since nothing is more important than helping those God has placed in my life to understand the only way to salvation, life, and true peace and joy is through my Savior Jesus Christ, I should know that God would not leave such an important task up to someone like me without his personal guidance. Later, in his talk at the dinner following the Mass, Cardinal-designate Tobin enumerated the fruitful ministries in the archdiocese made possible by all who contribute to the United Catholic Appeal: seminarian and diaconate formation, retirement funds for priests, Catholic school and religious education for youths, young adult and college campus ministry, pro-life and family life programs, and ministry to the poor through Catholic Charities. But he first recounted the story of how he heard of his appointment as a cardinal—through Twitter on his iPad early on the morning of Oct. 9 while staying at Saint Meinrad Archabbey in St. Meinrad. “But I’d prefer to talk about what I did two days after,” he said, referring to his celebrating the Mass of Christian Burial for the archdiocese’s oldest priest, Father Hilary Meny, who died on Oct. 7 at the age of 101 after 76 years as a priest. Cardinal-designate Tobin likened his appointment as a call “to widen my stewardship, and I think we’re all stewards in one way or another, because all of us make decisions on how we treat what we have, what we’ve received. Donations given in stewardship to the United Catholic Appeal are not lost, he said, because they further the merciful works of the archdiocese that no parish or deanery could accomplish on its own. “But mercy will continue. The Holy Father said, ‘Mercy is the very foundation of the Church’s life. … The Church’s very credibility is seen in how she shows merciful and compassionate love. “Thank you for your generosity [to the United Catholic Appeal], which has helped the Church bring mercy here in central and southern Indiana. … I’m confident that all of you will make as generous a response as you can.